from my bookshelf: WWW Wednesdays 10-31-12 - What am I reading this week? 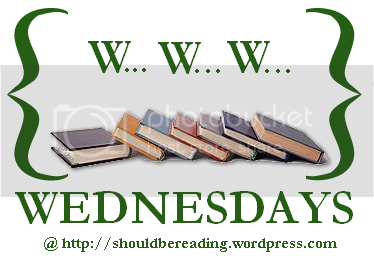 WWW Wednesdays 10-31-12 - What am I reading this week? This week, I'm working on Titus Groan by Mervyn Peake, the first book in The Gormenghast Trilogy. It's the October selection for the book group that I belong to, and so far I'm really enjoying it. I'm about halfway through the book, and am planning on finishing it this weekend. (I know what you're thinking... This is the last day of October, what am I doing waiting until the first weekend of November to finish the October selection? Well, this book is a chunkster, and everyone in the group is running behind on this one, so we're all in the same boat together.) Peake was a contemporary with J.R.R. Tolkien and C.S. Lewis, but he just never became as popular in the US. There is so much character development at the beginning of this book, that I'm really not even sure what the story is really about, as I'm still being introduced to the characters. I'll post up a review next week when I finish it. I'm also working on Deborah Harkness' Shadow of Night on audiobook right now. I am so thoroughly enjoying Harkness' books. This book deals with time travel, and while this can be a tricky subject sometimes, Harkness is dealing with it very well. I also love her characters. She does such a great job fleshing out her characters! The audiobook is read by Jennifer Ikeda, who did a superb job with the audiobook of A Discovery of Witches, and I wanted to continue listening to the series based on her performance alone. If you enjoyed A Discovery of Witches, I'd highly recommend continuing with Shadow of Night. It picks directly up where Discovery ends, and deals with Diana and Matthew's journey to London, 1590. Highly recommended! I just finished Joyce Carol Oates' Zombie this morning, and all I can say is what an extraordinarily disturbing book! Told from the point of view of a serial killing sexual deviant, the book is not necessarily easy to read, and Oates does a good job at making the reader feel uncomfortable with not only the content of the story, but with the actual act of reading the story. Written in broken sentences and structures, we are seeing the world through the eyes of Q__ P__, and the world through his eyes is not a very pretty place. Recommended, but not for the squeamish. I also recently finished with Ransom Riggs' Talking Pictures: Images and Messages Rescued from the Past. This is a collection of photos found at rummage sales and garage sales, and the captions that accompany them. Some are funny, some are touching, and all shine a light on times long past, even though we really have no frame of reference to what's going on with the photos, who they are of, or who they were supposed to be for.I really enjoyed this book and would look forward to another such volume from Riggs in the future. I'm envious that you are in a book group! I miss being in one. I also have Harkness's Discovery of Witches on audio...hopefully I'll get to it soon. I tried it once but just wasn't in the right mood for it that day. I think the audio is fantastic! The narrator does such a great job, IMO. You should give it another go sometime. I'll have to look into The Gormenghast Trilogy, I've never heard of it, yet it sounds like something I'd like! I also want to find that Ransom Riggs book just because vintage photography is AMAZING! Ooh, that Riggs books sounds amazing and I have both Harkness books on my desk waiting patiently for me to crack them open. The Riggs book sounds like fun--especially since the author used those "found" pictures as the basis of Miss Peregrine's Home For Peculiar Children. I want to read the Harkness book, maybe I'll give it a go on audio! I'd read some bad reviews of Zombie but you've tantalized me with yours. I think I'll download the free sample and see how it goes. Are you liking the Peak book? You mention character development, but I'm not sure if you're enjoying it. I enjoyed the first of Harkness's trilogy but for some reason haven't started this one. I need to!